Mayor of the Dubbo Region Ben Shields is looking forward to flicking the switch on energy efficient lights across some of the regions sporting fields. “I’m very excited about Council’s latest lighting project which will not only improve two sporting facilities across Dubbo and Wellington, but be more energy and cost efficient for our community,” said Clr Shields. Dubbo Regional Council are currently installing new energy efficient LED lighting systems at Pioneer Dubbo Sports Park and Pioneer Park in Wellington. Dubbo Regional Council’s Sporting Asset Coordinator, Wes Giddings said the new lighting system will hopefully see an increase in other sporting groups using the facilities. “The new lighting systems will also allow the local soccer associations to train and play night games in both Dubbo and Wellington, which will be a huge boost for the associations,” said Mr Giddings. 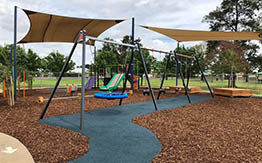 Pioneer Dubbo Sports project will cost $193,780 funded from Council’s capital renewal works budget for 2018/19 is has been completed this week by local contractors. The Pioneer Park Wellington lighting system will commence installation this week and is a result of receiving $220,000 from the State Government’s Stronger Community Grants, Major Project fund along with the Wellington Soccer Association receiving a community grant of $5,000 from The Stronger Communities Community fund. “The new lights are an energy efficient 200lux LED system. It is the first time using these lights in sporting facilities within the Dubbo Region. The cost to run the new sports lights is roughly a third of the cost of the current systems around the region,” said Mr Giddings. The two lighting projects are expected to be complete by early February 2019.